You can print from one of our public access computers or a USB flash drive. Each of our libraries have computers available for public use. These computers may be booked for 1/2 hour or 1 hour. One booking per day per person. Bookings can be made on arrival at the library. Children under 12 must be supervised by an adult at the computers. Please contact your closest library for more information. Free wireless internet is available during library hours at all branches of Gladstone Regional Libraries. Library staff will provide limited assistance, up to ten minutes, for Internet or computer enquiries. Library staff do not provide in-depth training; for individual or in-depth help with using computers, laptops, tablets, or websites you will need to make a booking with the My Library – Technology and Information Assistance service . These guidelines are designed to assist clients to access the free public computers and the Internet in a responsible and informed way. Although all care is taken to ensure a virus free computer for public use, this cannot be guaranteed. Damaging or destroying equipment, software, or data belonging to Gladstone Regional Libraries or other clients. Unauthorised monitoring of electronic communications. Intentional unauthorised copying of copyright protected material or infringement of license agreements and other contracts. Attempted or actual violation of any computer network’s security system. Violation of the privacy of individuals or entities that are creators, authors, users, or subjects of any information resources. Harassing, insulting, slandering, or libelling of other clients or staff. Infringement of this policy will result in user privileges being restricted and staff instructing you to leave the public computer room. Parents or guardians must assume responsibility for their children’s use of the public computers and Internet. Children under 12 years of age must be supervised by an adult in the computer area. Gladstone Regional Libraries does not censor access to material nor protect clients from information they may deem offensive. However, users should recognise that other members of the public will have full view of the computer and should be mindful of what sites they access on the Internet. Gladstone Regional Libraries is not able to guarantee access to the Internet, or particular sites, or that the service will meet user expectations. 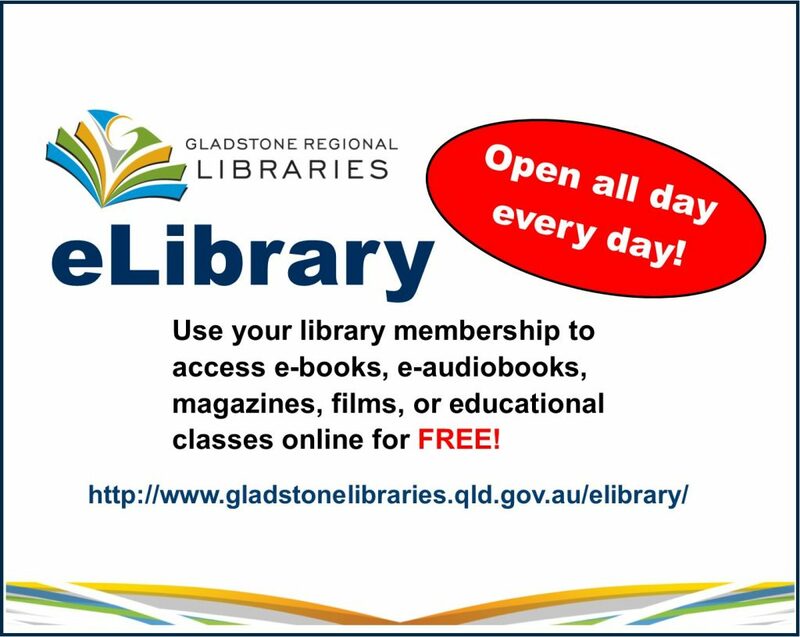 By accessing the library computers or Wi-Fi you will be deemed to have released and discharged Gladstone Regional Libraries and Gladstone Regional Council of all liability in respect of any defamatory material or viruses. Search the catalogue or login to your library card to renew, reserve, or check due dates! eLibrary open all day, every day! of the Gladstone Regional Council.